Summer is almost here and traveling can be a an option for those on dialysis but only with approval from both a primary care physician as well as nephrologist. A summer vacation can be overwhelming for the average adult, yet alone, for those who have compromising health situations. Therefore, it is vital to take some necessary steps to ensure a safe and enjoyable trip! The first step before the journey is to speak to your social worker as soon as you have specific dates in mind for your trip. Never secure dates, make reservations, or purchase tickets before this meeting. During this conversation, your social worker will assist you in locating the dialysis clinic nearest you while away from home as well as making sure all proper documentation is sent. Consider your choice of travel options. Traveling by air will most likely be more convenient for you, although this is obviously dependent upon how far your final destination is. If, however, you are using ground transportation, consider road conditions and the time of the year. Poor weather conditions can not only be stressful but may also prevent you from arriving to the nearest clinic for dialysis. This can result in very a serious and possibly life threatening situation. After dates and times have been approved by the clinics you will visit, you will need to address some other important issues. Make sure before leaving to have the name of the dialysis facilities you will visit along with their addresses, phone numbers and preferably a contact person to bring with you. Keep copies of important information in two different places such as on your person and in your luggage. Before leaving town, confirm with both your dialysis facility and those being visited that all needed personal medical records have been sent and received. Make sure all requirements from both clinics have been met. While away, have a few specific items with you to aid a more relaxing experience. Blankets, pillows and sleep masks are just a few items that can be overlooked when packing. Insurance coverage prior to leaving will need to be confirmed by your social worker. When traveling out of state, different rules and restrictions may apply. Be sure to research clinics to see if there is a fee for being a guest dialysis patient. Some clinics have been known to charge additional fees that must be paid when services are rendered. It is important to have reserve funds on hand. 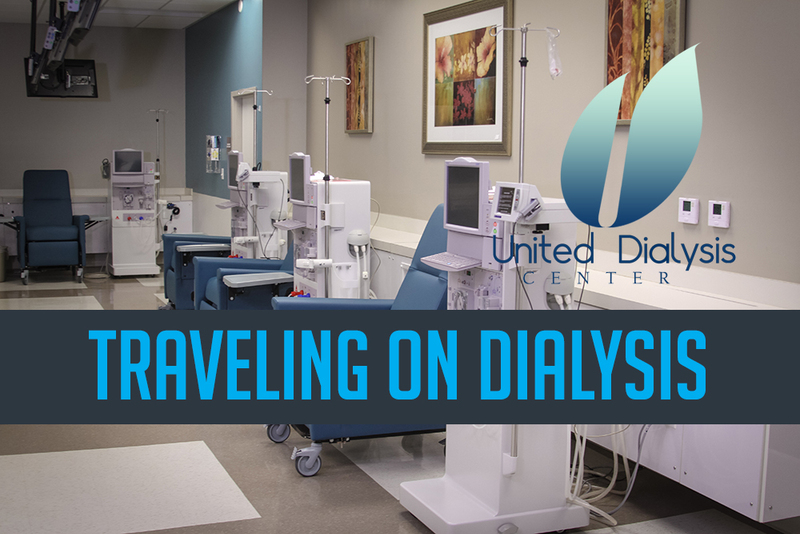 If, for some reason, you are not able to receive dialysis locally and need to return home unexpectedly, always have emergency travel funds available. Again, there can’t be enough emphasis on how important it is to consult and get full approval from you primary care physician as well as your nephrologist before traveling outside of your local area. After getting the go ahead, follow these few simple precautionary measures to aid in a safe and enjoyable trip! United Dialysis Center can be reached at (754) 307-1536.